The team behind the e-Go SSDR has reached its £500,000 investment target, following a crowdfunding initiative launched in December. Initial aircraft deliveries are now expected in early 2015. Backed by serial tech investors, Herman Hauser and Marshalls of Cambridge, the project secured over £500k of its funding target in less than a month, through crowdfunding platform, SyndicateRoom. 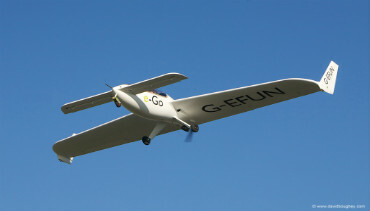 e-Go aeroplanes is based at an airstrip on a converted farm near Cambridge, where its international team of engineers has designed a single-seat aircraft for the private pilot market. The company, which secured £550,000 from professional investors when it launched two years ago, is led by Malcolm Bird, a former director of global silicon chip producer ARM. Its chief designer is Giotto Castelli, an aeronautical engineer from Italy. A prototype e-Go aircraft is currently undergoing flight testing, with the first production models due to be delivered in early 2015. Its ultra-light design meets the requirements of the CAA, which recently eased red tape on the developers of single-seat aircraft. The aircraft will initially go on sale in the UK and US with a price tag of around £50,000 plus VAT. There are 60,000 licensed pilots in Britain, and 600,000 in America. Gonçalo de Vasconcelos, founder and CEO, SyndicateRoom, commented, “Few companies better epitomise the creative brilliance of British engineering than e-Go. Who else could take Formula One racing car technology, adapt it into a beautiful and groundbreaking aircraft design, and then build and test it on a farm in Cambridgeshire? “We are delighted to see such an overwhelming response to the e-Go launch. It shows that investors are championing British innovation and manufacturing, which is a very positive sign for UK Plc.